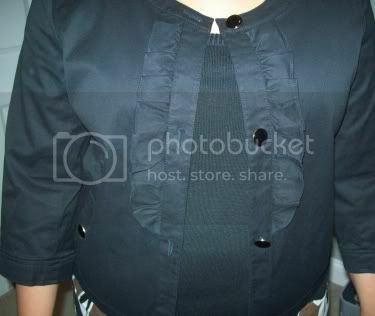 I am starting with the pro pic of this jacket - in khaki so you can see the cute details! I needed black, and really did NOT need another khaki jacket, but I may go back LOL. For some reason this jacket is on sale in ALL colors in store, but online some colors are sale, and some are regular? Dunno what's up with that. oh, i love that skirt!!! I agree.. the skirt is soooo cute.. but the details on that jacket are soo darling..cute cute cuuuuute! I loove that jacket. And it's great with the suit - and like Frances said, definitely worth having in a few colors. What a great outit!!! That skirt is fantastic and I love the jacket. I'd go back for the khaki too! I own this jacket too! In the khaki, like the model. But, I'm a 16P, so it doesn't look that similar to the model's! Ha! Love the jacket...looks cute on us short & curvies!